I was up at 1:30, Texas time, Tuesday morning. I left the motel at 3:30 with Pastor Mark Foster of the Liberty Baptist Church to go to the Wilmington, NC., airport for a 5:30 flight to Charlotte, NC. I had a 7:30 US Airways flight to DFW to catch. I flew then to DFW and went to Terminal B to catch the America Eagle flight to Shreveport. The 11:15 flight was full and when I found my 15A seat and sat down I notice some very tall men coming on the plane all dressed in Louisiana Tech warm ups. In 15 D and 15 E sat Coach Kerry Rupp and his dear wife. I introduced myself and gave them our churches Gospel tract. After about 10 minutes of talking basketball, which included Bobby Knight of whom Coach Rupp was associated with at Indiana along with several of his own coaches, and Tom Izzo of Michigan State, I went over some Scriptures with them and presented the Gospel. They listened and were very kind in allowing me to present the Gospel. When I finished I asked them if I could pray with them and they said “Yes.” In just a few moments they prayed and invited Christ into their hearts. I was thrilled and hopefully will be able to stay in contact with this great Coach. By the way, Louisiana Tech had a 24-11 record this year. 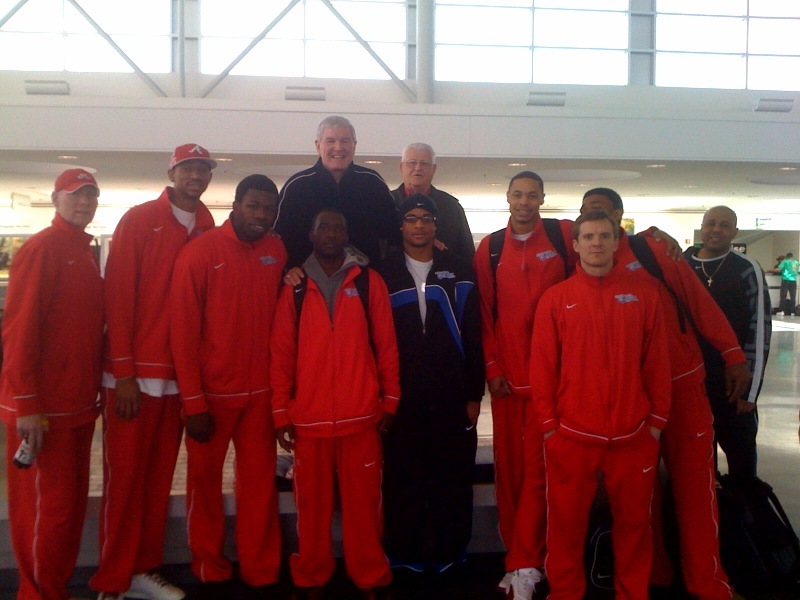 They just came back from the CIT tournament where they lost to Missouri State. They had lost their three top players to injuries and were not at their best for the tournament. Gotta love soul winning!